Service Tax is levied under Section 66B of the Finance Act, 1994 as amended up to date. Section 68(1) confers liability to pay service tax on service provider but section 68(2), which has overriding effect over section 68(1), confers liability to pay service tax on the receiver of such taxable service as notified by Central Government. The reverse charge mechanism (RCM) was first introduced effectively from 01-01-2005 vide Notification No. 36/2004-ST dt. 31-12-2004 read with Rule 2(1)(d) of Service Tax Rules, 1994. With effect from 01-07-1012 a new mechanism of reverse charge (RCM) and partial reverse charge or joint charge (PRCM / JCM) was introduced with the introduction of negative list regime of service tax. 1. Applicability of RCM/PRCM is dependent on the status & location of Service Receiver (SR) and Service Provider (SP) and taxability of service. RCM does not apply on non-taxable and exempted services but applies on abated services and where value is determined by valuation rules. 3. Service Receiver is liable to pay service tax under this mechanism from very first invoice received under this category. It means SR is liable to pay ST even when SP is within the ambit exemption limit under NN 33/2012-ST.
(b) Where whole of ST liability is of SR i.e recipient of service. As a result, who is engaged in providing taxable services falling under full RCM, will not be able to take Cenvat Credit of ED & ST in respect of ‘input’/’capital goods’ and ‘input services’ respectively. 6. In case of Service Providers (SP) rendering the services all of which falls within the ambit of complete reverse charge mechanism; he cannot avail Cenvat credit of input or input services. But, Service Receiver (SR) who is paying service tax under RCM can avail Cenvat credit as per Rule 4(7) of CCR, 2004 for any output service [refer Rule 3(4)(e) of CCR, 2004] on the basis of challan evidencing payment of ST [refer Rule 9(1)(e) inserted by NN 18/2012-CE (NT)]. (b) A service provider also discharging ST liability under section 68(2), is unable to utilise such Cenvat credit against his ST liability on output services, refund is admissible as per Rule 5B of CCR, 2004 as amended by NN 28/2012-CE (NT) dt 20-06-2012 but CBEC has not notified its claiming procedure so far so practically it can’t be claimed till date. It is pertinent to mention here that Rule 5B does not cover refund of Cenvat credit availed on capital goods. So it becomes non taxable service. Reverse Charge: if the person liable to pay freight falls within the category of persons specified under Rule 2(1)(d)(i)(B), reverse charge apply. any person who pays or is liable to pay freight either himself or through his agent for the transportation of such goods by road in a goods carriage is liable to pay service tax. Provided that when such person is located in a non-taxable territory (i.e. in J&K or abroad), the provider of such service (i.e. GTA) shall be liable to pay service tax. (i) cotton, ginned or baled. 7 Services of goods transport agency in relation to transportation of goods. 25 CENVAT credit on inputs, capital goods and input services, used for providing the taxable service, has not been taken by the service provider under the provisions of the CENVAT Credit Rules, 2004. 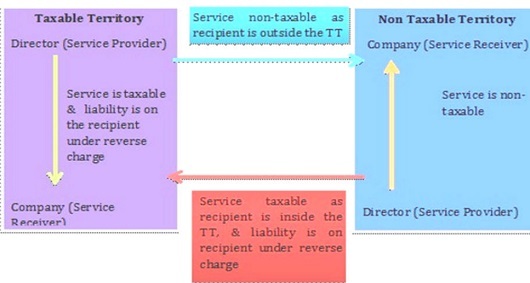 Note: When service provider is located in a non-taxable territory (i.e. in J&K or abroad), the receiver of such service shall be liable to pay service tax under reverse charge mechanism in all cases. I would also like to discuss mega exemption notification 25/2012-ST, entry no. 6(a) & (c) which exempts the following taxable services from the whole of the service tax leviable thereon under section 66B of the said Act and reverse charge mechanism does not apply over exempted services. I would also like to discuss mega exemption notification 25/2012-ST, entry no. 6(b) & (c), which exempts the following taxable services from the whole of the service tax leviable thereon under section 66B of the said Act and reverse charge mechanism does not apply over exempted services. (*) Note: This reverse charge mechanism does not apply in case of specified services as referred in clause I(A)(iv)(C) (1) & (2) of NN30/2012-ST dated 20-06-2012 rendered by Government or Local Authority to any business entity located in taxable territory. Where Works Contract is for… Value of the Service portion shall be..
(a) for a residential unit satisfying both the following conditions, namely:–(i) the carpet area of the unit is less than 2000 square feet; or(ii) the amount charged for the unit is less than rupees one crore; 25 (ii) The value of land is included in the amount charged from the service receiver.”. (a) for a residential unit satisfying both the following conditions, namely:–(i) the carpet area of the unit is less than 2000 square feet; and(ii) the amount charged for the unit is less than rupees one crore; 25 (ii) The value of land is included in the amount charged from the service receiver.”. If a person has two establishments/branches, one in taxable territory and another in non-taxable territory, both shall be treated as two distinct establishments of two distinct people. (c) a person located in a non-taxable territory. Para 10.1.6 of ST Education Guide: How is the service recipient required to calculate his tax liability under partial reverse charge mechanism? How will the service recipient know which abatement or valuation option has been exercised by the service provider? The service recipient would need to discharge liability only on the payments made by him. Thus the assessable value would be calculated on such payments done. (Free of Cost material supplied and out of pocket expenses reimbursed or incurred on behalf of the service provider need to be included in the assessable value in terms of Valuation Rules) The invoice raised by the service provider would normally indicate the abatement taken or method of valuation used for arriving at the taxable value. However since the liability of the service provider and service recipient are different and independent of each other, the service recipient can independently avail or forgo an abatement or choose a valuation option depending upon the ease, data available and economics. Section 68 (1) Every person providing taxable service to any person shall pay service tax at the rate specified in section 66 in such manner and within such period as may be prescribed. Section 68(2) Notwithstanding anything contained in sub-section (1), in respect of such taxable services as may be notified by the Central Government in the Official Gazette, the service tax thereon shall be paid by such person and in such manner as may be prescribed at the rate specified in section 66 and all the provisions of this Chapter shall apply to such person as if he is the person liable for paying the service tax in relation to such service. Provided that the Central Government may notify the service and the extent of service tax which shall be payable by such person and the provisions of this Chapter shall apply to such person to the extent so specified and the remaining part of the service tax shall be paid by the service provider. Rule 5B of CCR, 2004: Refund of CENVAT credit to service providers providing services taxed on reverse charge basis. – A provider of service providing services notified under sub-section (2) of section 68 of the Finance Act and being unable to utilise the CENVAT credit availed on inputs and input services for payment of service tax on such output services, shall be allowed refund of such unutilised CENVAT credit subject to procedure, safeguards, conditions and limitations, as may be specified by the Board by notification in the Official Gazette. Section 65B(44)Explanation(3): For the purposes of this Chapter……(b) an establishment of a person in the taxable territory and any of his other establishment in a non-taxable territory shall be treated as establishments of distinct persons. Plse give information on Organic manures tax percenage .CHapter 31 is fertilssers. as a trader/importer, ST of 1.4% of CIF value, paid by us is cenvatable or not. i am not registered under service tax. do we have to register. is RCM applicable ? I am an exporter of services. Service Receiver is liable to pay service tax under this mechanism from very first invoice received under this category. It means SR is liable to pay ST even when SP is within the ambit exemption limit under NN 33/2012-ST. Please clarify the above. We have paid for legal service for X amount…. which falls under notification NO 30/2012. According to the rule I have to pay the service tax on behalf of my SP. As our company is new, we already have excess Cenvat Credit then payable amount of Service Tax. My question is do I have to Pay service tax for the said legal service or I can adjust against the excess cenvat credit ! I would like to know that if any company is obtained a External Commercial Borrowing from Foreign Bank, the amount paid as expenses to various agencies situated at India and abroad, the Expenses paid to them is liable to pay service tax under RCM (on borrower company) or not? Please advice the ST liability in pre and post Negative era. What should be the % of ST if there’s a delay in the payment of Service Tax, under RCM. Entity is paying Freight Charges, but not deducting the ST from the previous year (i.e, 2014-15) Will the Tax rate differ? would the entity incurr Interest and Penalty? I am paying service tax vide single challan for two different years. Moreover this challan contains payment under reverse charge and for output service also whether there is any circular regarding the same or any solution how i can fill my details in service tax return??? we are service receiver,we received a man power supply service from ABC Ltd, they are raise a bill value Rs.1,00,000/-(Inclusive ST). Can anyone explain about what is the entry post on our books of accounts.Plz explain abt it. i am receiving legal service by advocate of rs.3000/month. but my advocate have not service tax no. He is under exempt limit. then my question is what i have to pay service tax on amount. if yes then tell me what i am claim it. Can Service tax liability under RCM be discharged using SEIS & MEIS scrip? I have received a service of transport, cargo, fright, multiple services from a Agency. agency is provides me such above mentined services from other transporters. Agency provide me a invoice contains ST on his agency commission only. should i liable to ST on RCM basis over transport, cargo, fright services, which are reimbersment from me. or if not then should I have to deduct tds over full amount or only agency’s commission amount? Please provide analysis of amendments. I took service from an immigration company, I’ve paid first instalment but they didn’t have provided me any service since January 2015 from last 2 months after a long chain of emails they agree to refund my money but now they are deducting service tax. So I want to know that whether I can get service tax back as I haven’t received any service from their end?? And on what grounds they are asking for service tax? sir , you are really serving the professionals with your knowledge bank. Sir, you have given the best summarized details of the above categories which are mainly in use in current scenario. These are easy to understand to new freshers who are jut joining corporate for service tax. Please inform whether ST reverse charge mechanism applicable for security services received from lilited company? My client is a SSI Company, not otherwise covered under Service Tax due to threshold limit. Whereas to discharge his liability under RCM, does he need to Register and avail Service Tax Registration Number? Or a monthly payment of Service Tax vide challan will be sufficient? Is it mandatory to file Service Tax returns? If (Professional)service provider is individual and doesn’t have service tax number, at the same time service taker is a company and is there chance to apply of reversal mechanism? taxi operater providing Taxi service to a Limited Company. Is there is any Difference Between Insurance Agent and Insurance Broker For the Purpose of RCM??? Is there is any difference between Insurance Broker and Insurance Agent for RCM Purpose?? A service provided by an individual of providing meal or supply of food. which is coming in reverse charge mechanism. Any other bank had done the payment on behalf of my client. We are reimbursing the Amount to bank as per their claiming sheet. service provider is coming in exemption limit. but on bills he had written my Client’s Name… So my question is.. service tax should levied or not under RCM..?? Good article. Clarifying so many implied and hidden provisions. Sir you are requested to always keep updating us by your lucid interpretation of laws and conclusion thereon in matters relating to service tax. Very good article. Clarifies many queries. Absoluetly superb . Efforts deserve great appreciation. Well updated information about various services under RCM as well as PRCM, it is a good for those assessee, who is covered under this category of scheme. Sir you are requested to always keep updating us by your lucid interpretation of laws and conclusion thereon in matters relating to service tax. Good article. Clarifying so many implied and hidden provisions.